Top of head broad and flat. Top of ears should be level with top outline of the skull with the burr partially exposed and the entire edge of the ear visible. 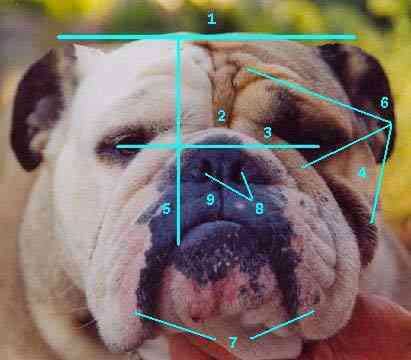 An imaginary horizontal line passing through the four corners of the eyes should be at a right angle with the stop and just rest on top of the nose. Cheeks, well rounded and extended sideways beyond the eyes. Viewed from the front, the skull should appear very high from the corner of the lower jaw to the apex of the skull. The head and face should be covered with heavy wrinkles. The flews, called the chops should be thick, broad, pendant, and very deep, hanging completely over the lower jaw at the sides (not in front). They should join the under lip in front and quite cover the teeth. Nostrils large, wide and black. Well-defined straight line between the nostrils.